Over the last few years, LED-based lighting has been cropping up everywhere, lighting our homes, cars and streets and backlighting our phones and TVs. But why are these light sources more efficient than old-fashioned light bulbs, and why does this efficiency matter? Why do we need LEDs? The lighting sector accounts for more of our global energy usage than many of us realise. Lighting accounts for around 20 percent of all our electricity use, so the potential energy savings and reduction in carbon emissions from more efficient light sources are huge. High-quality LEDs are also much longer lasting, and should be able to last decades. This is especially valuable for things like street lamps, where replacing the light source causes lots more disruption than changing the bulb in your living room. The LED light bulbs on the shelves today look a lot like an old-fashioned lightbulb, but there’s lots more going on inside. Rachel Oliver, also from the University of Cambridge, sliced open one of these bulbs to reveal what was going on inside. Slicing inside an LED bulb to see the phosphor cap (left) and the LEDs themselves (right). On the bottom of these bulbs, there’s a lump of metal to act as a heat sink. LEDs don’t produce much heat but it is bad for them, so the heat sink is needed to remove it. This also means more efficient LEDs are cheaper to make as a smaller heat sink is needed! Underneath the outer light-diffusing cap there’s something that looks like a small ping-pong ball covered in a chemical called a phosphor (more on that later). Finally, underneath this, at the core of the light bulb, are the small LED chips themselves - this lightbulb has six. LEDs used in lighting are made from a material called gallium nitride. It isn’t found in nature, so LED manufacturers make thin layers of gallium nitride by reacting gases together in large crystal growth systems. Rachel showed me around one of these growth systems to see how they work. These layers are grown on top of thin slices or wafers of a crystal, usually sapphire or silicon. Each wafer can be chopped up and processed into many thousands of individual LED chips. The gases pass through tubes in something called a showerhead (much like a large version of the showerheads we have at home), to bring them close to the surface without reacting together beforehand. The wafers are heated up to around 1000 degrees C and the gases react together on the surface and build up the material layer by layer. The gallium comes from a chemical called trimethylgallium and the nitrogen from ammonia, which react to form gallium nitride and methane. By adding in other gases to create slightly different layers the structure of the LED is slowly built up, like a layered cake. 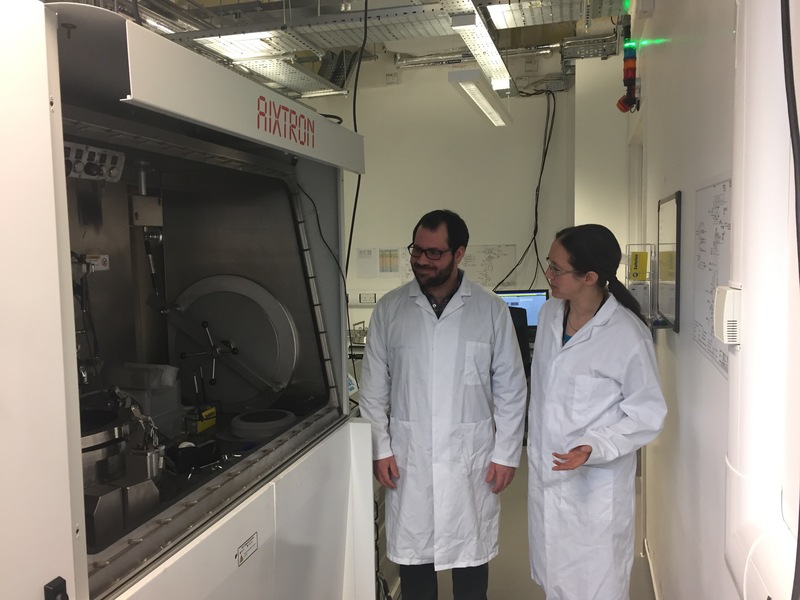 Rachel showing me a crystal growth reactor. How do they make light? Old-fashioned tungsten filament lamps make light by passing a current through a wire, heating it up, until it is glowing white hot. Only a little bit of the energy comes off as visible light so these bulbs are very inefficient – the light is a by-product of heating. LEDs, on the other hand, produce light in a much more direct way and lots more of the energy is converted to light. LEDs are made from materials called semiconductors. In an atom, electrons orbit the nucleus in certain allowed energy levels. When the atoms come together to form a semiconductor, these energy levels all mix together and the electrons can now sit in certain bands of allowed energies, with forbidden energy gaps in between. You can think of this a bit like walking up stairs – you can only put your feet on the steps. In a similar way, the electrons can only sit in these energy bands. To understand how LEDs produce light, we need to look at the layers they are made from. By adding in other ingredients to the layers, called doping, the properties can be changed. On one side of the LED, a little bit of silicon is added, which donates spare negative electrons into the higher energy band. On the other side, a different ingredient is added, usually magnesium, which takes in electrons from the lower energy band. This leaves behind positive gaps, called holes, where the electrons used to be. When the LED is connected to a power source, the electrons and holes are pushed together and combine to give out light. When the LED is connected to a power source, the negative electrons and positive holes are pushed towards each other. When an electron and hole meet, the electron falls into the hole, like a snooker ball falling into a pocket, losing energy. This extra energy is given out as light. The very thin light emitting layers Rachel mentioned help the electrons and holes to meet up more efficiently. In these layers at the centre of the LED (each around ten atoms thick!) some of the gallium is swapped for indium. The energy gap in these layers is smaller, so the electrons and holes are trapped close together in these very thin layers and are more likely to meet and combine to form light. The light these LEDs give out is blue, but we want nice white light. LED bulbs use chemicals called phosphors, which were on the yellow ping-pong ball shaped cap in our bulb, to convert some of the blue light to yellow light. The resulting mix of blue and yellow makes white light, and choosing slightly different phosphors can give a warmer or a cooler white light. Another way to make white light is to have a mix of red, green and blue LEDs and, by mixing the light from these together, create whatever shade of light you want directly from the LEDs. However, green LEDs are still much less efficient than blue or red, as they have to be grown at a lower temperature. This gives a poorer quality crystal, which interferes with combining the electrons and holes to produce light. This is one of the ongoing areas of LED research, as well as making them perform better when more electricity is put through them, and generally increasing the efficiency and reducing the cost. But some colour-tuneable LED lights are available today. In fact, Nasa have recently sent LED lights into orbit to help astronauts sleep better on the International Space Station (ISS). On the ISS the sun rises and sets every 90 minutes, which can play havoc with sleep cycles. These LED lights can be tuned from normal lighting to a redder light before they sleep, and can even be shifted to a bluer ‘alert’ setting to help their hone their attention for important tasks. LEDs keep getting more efficient, cheaper and better at rendering nice white light. 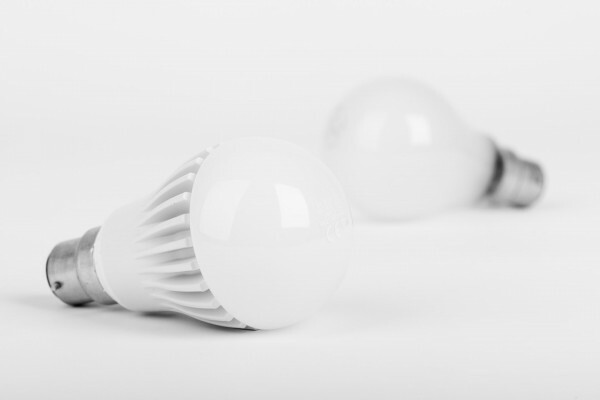 Given the huge energy savings they can offer, and the reduction in carbon emissions this would generate, they look set to become increasingly widespread: for LEDs, the future really is bright. Why are blue lights harder to see?